Half end of my week last week were dedicated to my children’s school benefit event also celebrating Chinese New Year, Year of the Ox 4707. This is an annual event not only for the purpose of raising funds for the school that supports their excellent curriculum, but it is also the moment to showcase the traditional and beautiful culture of Chinese / Asian artistry in dance performances such as the lion dance, taiko drums, kid's traditional Chinese dances, and more. The school board committee is in charge of organizing this huge event and since I am in the school advisory board, I had the pleasure in taking part of the planning process. Well, the event happened this past Saturday and although I’m still tired from all the work, I am happy that it all ended in success. Come and check out my short video of the event’s highlights. By the way, that is my daughter in her Chinese garb. Gong Hay Fat Choy! 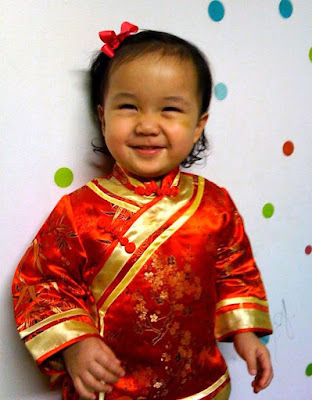 We went to a Chinese New Year celebration with our kids. They loved the Lion Dance. How truly lucky you are to have a cultural school near you. There aren't any resources around us where Amara can really learn about her Asian heritage. The benefit looks like a beautiful event! Katie looks awesome!!! Wow, I have never been to a Chinese New Year celebration, it sure did look fun.